It's River City Ransom with a side order of Track & Field. What do you get when you combine the River City Ransom theme with Track and Field-style gameplay? 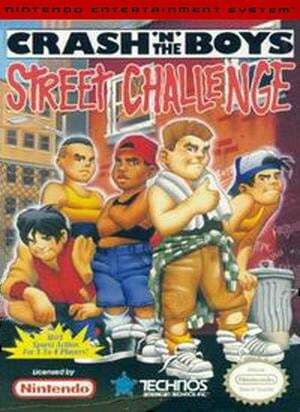 You get Crash 'n the Boys: Street Challenge. 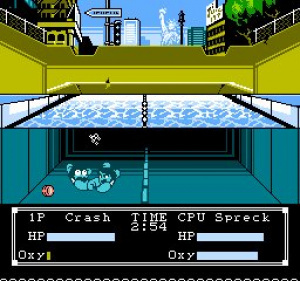 The game takes the street gang theme and creates some fitting Olympic-style events to go along with it. Sounds like a mouth-watering proposition, but sadly while the unique urban competitions have a lot of charm to them, the slightly erratic execution of the gameplay tends to pull the whole experience down. The game itself revolves around five sporting events that are created to specifically fit within the urban setting of the game. 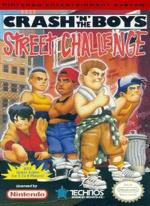 While the events themselves could have easily adopted the format of a traditional Track & Field title, they instead chose to make use of the street gang theme. While this itself isn't a problem, the way the developers have molded the play control around it certainly is. At the beginning of the game, you are allowed to choose your game mode. You can choose to play the entire package of events, play only three events at a time, or practice any single event. You must then choose the number of players that will take part, ranging from one to four players. Since there were only two controller ports available on the NES, players three and four must also share controllers one and two respectively - bit it's not really a big deal since you alternate playing in each event anyway. Once you've selected your options, you're then taken to the events themselves. There are five events available for play in the game. But before you dive in, you're given the option of shopping the various stores on the strip. Here you can purchase items to use against your opponents that range from special attack moves to items you can use to slow your opponent down with, like grease or tacks. It all depends on how civilized you choose to be in the game. The 400m Hurdles game starts off looking like any normal hurdle game you've likely played before, at least until the event begins. Then instead of merely running and jumping over the hurdles, you'll soon find yourself breaking the hurdles apart and using the pieces to attack your opponent in an effort to slow him down. The Hammer Throw is even more bizarre in design. While the initial throw is very reminiscent of the Olympic event, you'll soon realize that you're actually on a golf course where you must toss the hammer repeatedly until you reach the hole, trying to do so in as few tosses as possible. Of course the normal golfing hazards apply. Swimming is basically a brawl that just happens to take place in a swimming pool, where you basically try to drown your opponent as you beat them senselessly. Fairly simple stuff. Roof Top Jumping combines the thrill of pole vaulting with the offbeat silliness of riding a unicycle across a small connecting piece on top of various buildings in the neighborhood and is probably the most enjoyable of the various events. Last, but not least, is the Fighting Scene, which is basically a Double Dragon-style beat 'em up wrapped up into one tiny (but enjoyable) package. As you can imagine, the events themselves are interesting enough, but for some reason the tight play control you'd expect the game to feature never shows up. Instead a group of erratic control methods rear their ugly heads and make things overly complicated and not nearly as responsive as needed. That's not to say that there's not plenty of button-mashing fun to be had, there is; unfortunately, it's the other areas of each event, those that the developers felt the game needed - given its urban street setting - that make things more silly than playable. It's easy to see what the developers were going for, but you'll soon realize that they just weren't able to get there. The visuals are about what you'd expect from an 8-bit NES release, and closely resemble those of their River City Ransom counterpart. The event locations are all adequate in conveying the sport they're attempting to execute, but don't expect a lot of flashy graphical touches. 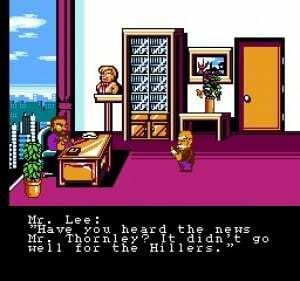 This is an NES game after all, so when you picture the visuals, think River City Ransom or Double Dragon and you should have a pretty good idea of what to expect. Much like the visuals, the 8-bit soundtrack isn't going to stop traffic. It's all fairly standard stuff, and some tracks sound like they might have even been rehashed from other releases in the series given their uncanny familiarity. As as far as sound effects go, they're all fairly standard, bordering on mediocre, even by 8-bit standards. You have to give credit to the developers for at least trying to do something different with this title. If you look closely enough, you can almost see what the game could have been had the proper time and effort been given to the gameplay system. It's certainly not a horrible game, but given the high quality of some of the other Track & Field simulations of the time period, it does feel rather inferior by comparison. It's also a game that's got a fairly large learning curve, so be prepared to put some time in if you expect to gain a hold on the play control in each event. Unless you're a huge River City Ransom fan or you're looking for something totally off-the-wall, you might want to take a pass on this one. It's a classic example of a great idea that was just never able to take shape. Thanks for this review, I think others gave it high scores simply because it uses the Kunio characters, I think I'll stay away from this one now! Huh...not as good as I expected. Not much detail about the controls, though. Any way you could try to explain what's actually wrong with them? Loose...stupid button assignment...unresponsive... Well, okay, so you said it wasn't as responsive as it should be, but I don't get what you mean by "erratic." Why do I feel Nintendo of Australia/Europe will give us this instead of Super Dodge Ball next Hanabi Festival? I remember playing this as a rental on the NES, and the controls for the Rooftop Jumping and Underwater Brawling events just mystified me. Plus I could never seem to earn any medals. I hope they release some of the Super Famicom Kunio-kun games as import titles, THOSE I would definitely pick up. More Japanese only Kunio games please, they never released the best stuff overseas, like Basketball, Marathon, 2v2 fighting, Ice Hockey, and there was a River City type game set in feudal Japan. It is so hard to find a famicom adapter for the NES these days, releasing them on VC would make it so much easier. I'll still pick this up eventually, just for the amusingly ridiculous concept, and the lovely NES graphics. "Having to control four characters per team also adds a layer of redundancy to the package that tends to make the events feel a bit too repetitive at times." Uh.. I don't see what you're getting at here? You only use one character per event, the idea is to choose the one most suited for the event, but also keep HP in mind, since you don't recover between events. Not really sure what you mean by control problems, either - they work fine here. The learning curve is quite steep, and the lack of a selectable difficulty curve makes it hard to practice since the computer is permanently stuck on "kill the newbie" level, but that's the only real fault I have with the game. It's primarily a multiplayer game, though - did you try it with others? Yeah, I say you missed the mark on this one - this is easily a 7 or 8. D'whaaaat? You guys said it came recommended on the Nintendo Download news item. Hmph. Well, I'll pass on it then. No, Drake said it came recommended. Corbie (who, for the record, hadn't even played the game when Drake wrote that) said you might want to take a pass. Nintendolife isn't one giant hive mind, of course there's going to be differing opinions. "Swimming is basically a brawl that just happens to take place in a swimming pool, where you basically try to drown your opponent as you beat them senselessly"
If they put this description on the back of the box I bet they would have sold more copies. Well worth 500 points in my opinion. It was an instant download for me and I greatly enjoy this one. I guess I could see where it's not for everyone though. @ Adamant - Yeah I didn't word that part about using four characters very well so I removed it. I just meant having to keep track of using four characters throughout the game. Just a very sloppy game to me, even by NES standards. It sounded like it had potential; I'm quite happy with the PC Engine Super Dodgeball game, Nekketsu Kōkō Dodgeball Bu - PC Bangai Hen which I find to be better than the arcade Super Dodgeball game. Pity, it sounds like a fun idea for a game. I hope we´ll get Super Dodge Ball one day. @Corbie - Yeah, that I can agree with (though there's still 5 characters per team, not 4 ) - the game will seem very overwhelming at first, throwing a whole ton of characters at you and expect you to make educated choices as for whom to use. All the Kunio sports games do this, but since you only use one character at a time here, it's more involving than it usually is. Well, IGN seemed to like it. Great fun, an easy 7 or 8. Boy, Scott Pilgrim sure had a lot of influence from this series. Sounds like an interesting idea for it's time and I might check it out. I love River City Ransom so I'm willing to give it a shot.